Located in Méribel’s exclusive village, Chalet Infusion is one of the most luxurious chalets in the area. 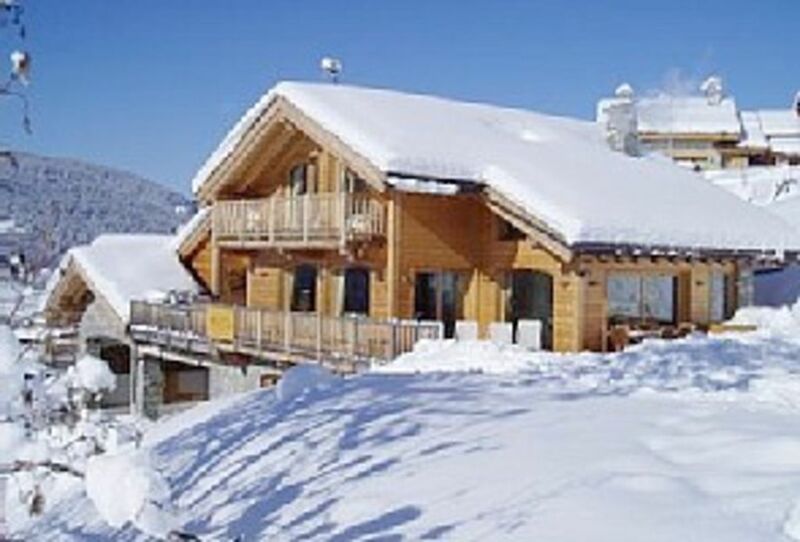 One of the few recipients of the Méribel Tourist Office’s ‘5* Label Meribel’ award, Chalet Infusion is located just 200m from the village’s bars & restaurants as well as the Telesiege du Golf chairlift which connects to the Altiport and from there the entire 3 Valleys network. Fully catered during the ski season and available to rent self-catered during the summer season. Built on three storey’s, Chalet Infusion is a typical Savoyarde property and features five ensuite bedrooms, four of which have balconies overlooking the mountains. Each is furnished in different fabrics, textures and antique furniture and four of the five bedrooms can be made into either a double or a twin and four are suitable for the inclusion of cots. The south-facing sitting room is at the heart of the chalet and features large, squashy sofas, a roaring log fire, HD satellite & terrestrial television, DVD, video, music and Ipod systems and floor-to-ceiling windows with views stretching across to the Olympe chairlift and the 1992 Olympics women’s downhill run. The adjacent dining room features a beautiful oak Tuscany table and French windows which open on to a very private sun deck. An expansive terrace, running round most of the chalet, features a Jacuzzi, Sauna, outdoor table and chairs, sun-loungers, outdoor heaters, table tennis, pool table, darts board, exterior music system and a fully stocked bar. There is a study area equipped with telephone, fax, computer, broadband and wireless Internet access and on the ground floor a laundry room, heated ski and boot room, on-site private parking and an ensuite massage room which can also be used as an extra ensuite bedroom for larger groups at a supplementary charge. The Winter in Meribel: The Méribel valley is one of the largest of the French Alps extending from Brides–les-Bains at 600m to Péclet-Polset at 3,560m. The town has 57 ski lifts in its immediate vicinity to serve 74 groomed ski runs that total 150 kilometres. One popular run is the Olympic women’s downhill run and as the epicentre of the world’s largest ski domain, there are endless stretches of off-piste. Queuing is a rarity thanks to a new electronic lift pass system unveiled in the 06/07 season, two 50 person cable cars, over 40 gondolas and 25 high speed chair lifts. The Méribel valley, including the purpose-built Mottaret area, suits skiers of all levels. Beginners can cruise down the wide gentle slopes of the Altiport, a tree-lined area ideal for those experiencing snow for the first time. For Intermediates, the range of runs is almost limitless with 89 blue and 116 red runs. For the truly Advanced skier every day here is filled with challenges and adventures. The Summer in Meribel: Many of Alpine Infusion’s guests return to our chalets during the summer months of July and August to be greeted by a totally different kind of playground. Laden with flowers, trees and dramatic landscapes the valley provides the perfect environment for hiking, mountain-biking, golf, climbing, parapenting, white water rafting, canyoning, horse riding, tennis and much more. The Vanoise National Park, France’s first National Park, is a boundary-less paradise of 140,000 acres, founded in 1963 to protect animal life and wild flora. Hiking levels reach to 3,855m and include 500km of maintained and marked trails which are not difficult and are accessible to any good hiker with suitable mountain gear. Méribel has many lovely restaurants, from relaxed crêperies to more gastronomic finds that cater for families and groups of friends. Many have flower-covered terraces where one can enjoy the sunshine at lunchtime or for aperitifs in the evening. Méribel is arguably the prettiest resort in the famed Three Valleys of France with its traditional Savoyarde wooden buildings, including the giant chalet-like Parc Olympique sports centre built for the 1992 Albertville Olympics. Founded in 1939 by British Colonel Peter Lindsay who stipulated that all buildings had to be constructed in traditional Savoyarde style using only wood, stone and slate, the town offers a wide variety of shops, bars and restaurants from the bustling après-ski bar Le Rond-Point to the cosmopolitan cocktail bar La Poste. The Méribel valley is one of the largest of the French Alps extending from Brides–les-Bains at 600m to Péclet-Polset at 3,560m. The town has 57 ski lifts in its immediate vicinity to serve 74 groomed ski runs that total 150 kilometres. As the epicentre of the world’s largest ski domain, there are endless stretches of off-piste and queuing is a rarity thanks to a new electronic lift pass system. Golf: Experience great highs – and fantastic lows in one of the world’s great golfing playgrounds: summer in the French Alps. There really is nothing like it – where tee shots come complete with mountain views and putting greens overlook deep blue lakes. Most golfers will tell you it’s what you score not what you see that matters, but the backdrop to these alpine rounds can be marvellous compensation when the spirit is willing – but the swing isn’t. Tignes 18 holes 4,820m Par 68. Ski: Méribel sits centre stage at the heart of The Three Valleys, the largest linked skiing area in the world. Courchevel, La Tania, St Martin de Belleville, Les Menuires and Val Thorens are all just a ski lift away, forming a vast skiers’ paradise of over 600km of groomed runs and 198 lifts. If you don’t see a certain kind of lift here, it hasn’t yet been invented. With mountain peaks rising to 3,300 metres, the snow cover is often the envy of other resorts, even in late April. Some 550 snow canons cover more than 350 acres. From La Chaudanne, the main Méribel gateway, every lift leads into a different valley, for example, take the Burgin lift to Saulire for fashionable Courchevel or Tougnete for the high altitude skiing of Val Thorens. The domain is immense and with the best lift system to be found anywhere, all levels of skier can ski the three valleys in a day without once removing their skis. In recent years, Orelle, a fourth valley, is fast developing behind Val Thorens.